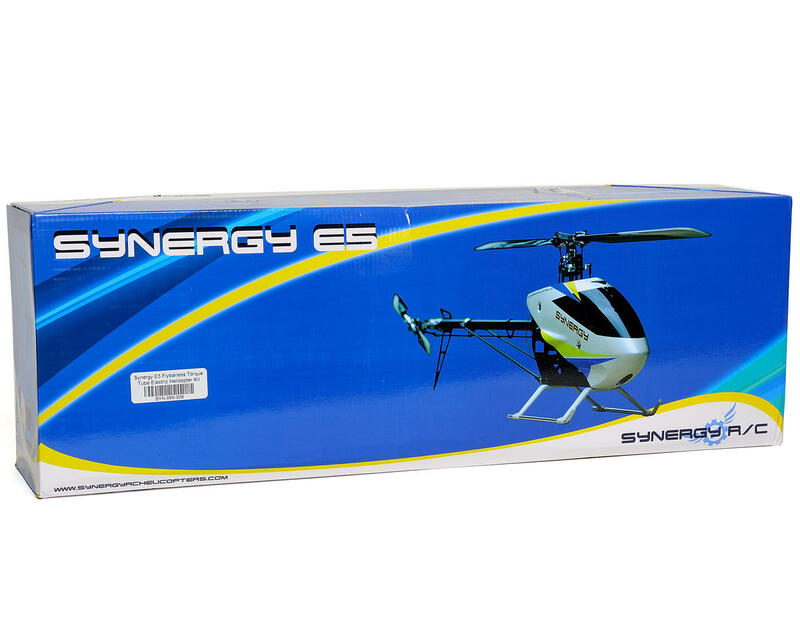 This is the Synergy E5 Flybarless Torque Tube Electric Helicopter Kit. The E5 is one of only a few “true” 550 class helicopters which can swing 550mm blades right out of the box. The large disk size provides the stability and “pop” most pilots are looking for in a high performance helicopter. The E5 was also designed with a path for growth in mind. 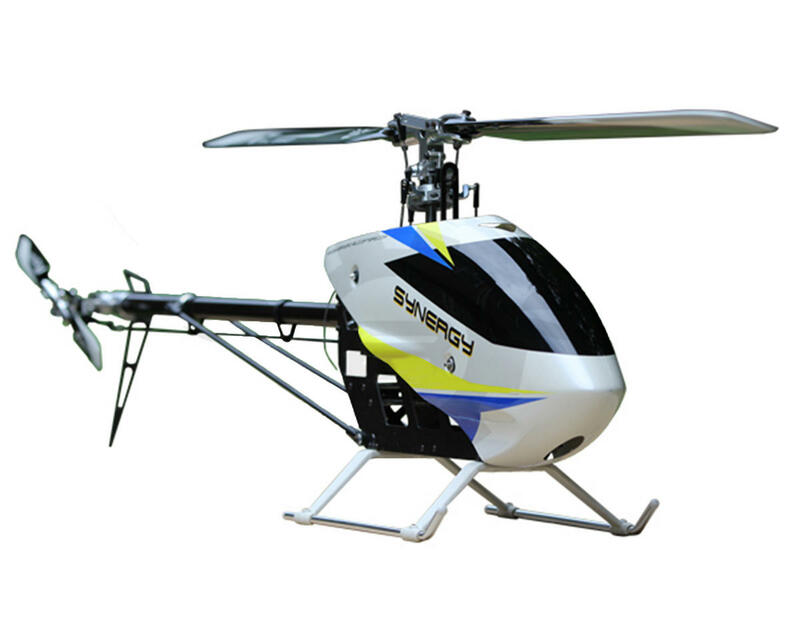 The E5 can be configured as a 6S 550 class helicopter which is perfect for the budget minded pilot that still wants a high performance helicopter but does not want to spend a lot of money on batteries. Since the E5 battery compartment can handle virtually any battery configuration and the motor mount can accept a variety of motor choices, the E5 can easily be converted into a 12S 550 class helicopter or stretched with existing parts into a 12S 600 class helicopter. The E5 is a true modelers helicopter which gives you the options needed to build and fly how you choose. I must say "This is the real deal". Very nice parts quality, everything went together perfectly, the machine work is awesome, very solid platform. I put the Rail mains and tail blades on it, MKS HBL980 tail, JR DS8717 cyclic. Got a chance to maiden 12/28/13 (break in the weather) WoW. I don't think you can go wrong with Synergy. Plus on line support team are a great bunch of people. They will answer your questions. Best I have seen on the web. A must have heli for your fleet. This is an excellent kit, top notch quality this is actually my second E5 kit. Made in the USA and the kit goes together like no other,Simply awesome. just bought my second one thru ebay took me two days to get it, that has to be a record. Thanks to Matt Botos for producing such a great line of helicopters and thanks to Amain for super fast shipping. E5 is the best helicopter kit I have ever flown. I assembled it and it flies flawlessly. Without picking up a wrench I have flown this E5 for over 200 flights now. :-) I am running rail 550 blades and 96mm rail tail blades,Kde 600xf-1100-G3, Talon 90 esc, ikon2Fbl, and futaba 7003sb and T14sgh, glacier 4400mah flight batteries. Good for about 4:30 to 5:00 minutes of flight. This bird does precisely what you want it to do with extreme accuracy. Recommend this to anybody beginner to expert! Been flying my E5 for about 9 months now and is my "go to" helicopter. The versatility of this kit is great too. It can be setup as a 550,600,650 or even a 700, but the kit ships as a 550 obviously. Flying mine on 12s but you can fly it on 6s if you prefer. One thing you should do is use the E7 tail slider but not necessary right away. I would not recommend as a first heli but if your looking to move into a larger platform, take a good look at this one. Good size and great performer.